Go West! Wrangle those kiddos, grab the stroller, the goldfish stash and go on an adventure. Check out the list of far off (or maybe not so far off) destinations below, for inspiration, parks, museums, attractions, and more for you and your little Ponce De Leons. Alive After Five: Alive in Roswell is a monthly free, family-friendly festival held concurrently on Historic Canton Street, Historic Roswell Square, and the City Hall Grounds. The festival occurs each 3rd Thursday evening (5:00-9:00 pm) from April through October. Swell Mama Tip: Fickle Pickle is the spot for a casual but colorful lunch that is very kid friendly. It just happens to connect to the Sugar Shack where ice cream and fresh baked goodies abound in a general store vibe. Marietta Fire Museum: The Marietta Fire Museum features a collection of items used by the Marietta Fire Department since the 1800s. The collection includes vehicles, clothing, equipment, antiques, photos, displays, and more. The museum is open Monday through Friday from 8 am to 5 pm, and on Saturday and Sunday by appointment only. Admission is free, and donations are accepted and appreciated. Cochran Shoals﻿﻿: Walk by the river with great views of water, ducks, geese, blue heron, deer, and lots of other wildlife! We always see something fun! East Cobb Park﻿﻿: A great playground with awesome tall slides! Swell Mama Tip: Each Swell Forever online purchase supports adoptive families and kids in foster care. Every gift purchased in The Swell Shop in Sandy Springs funds cribs for babies in need through Helping Mamas. The shop is less than 1 mile from the Sandy Springs library, be sure to pop by. Morgan Falls Overlook: Take a short family hike around the trails, have a picnic overlooking the beautiful water and end the day at the playground perfect for all ages. The porch swings overlooking nature are a great city escape. Sandy Springs Farmer's Market: This neighborhood favorite is set to really stand out as it moves to the new City Springs in downtown Sandy Springs every Saturday morning of the summer and fall. Concerts by the Springs: Every May, Heritage Sandy Springs kicks off their popular monthly series of concerts in the outdoor amphitheatre on Sunday nights. A wonderful cross generational experience. Definintely bring a blanket, comfy chairs and a grand picnic. Peachtree Dekalb Airport (aka PDK): Watch planes soar into the sky while enjoying the playground, concrete bleachers and picnic tables conveniently located right along the runway. Swell Mama Tip: Pack a picnic lunch or dinner and enjoy listening to your toddler’s unending squeals of delight---plane after plane! ZenTea: Experience high tea, or tiny tea! Best for toddlers who are comfortable holding a tea cup (3+), make a stop into this zen-like tea house. Pick from more than 200 varieties of teas. The lovely staff will even cool the tea down for little ones. Swell Mama Tip: The peachy non-caffeinated herbal tea and small scones are ideal for a treat that doesn’t add too much sugar. Frosty Caboose: Choose from a myriad of frozen delights at the aptly named ice cream shop, which lives infor the red caboose car situated along the railroad tracks near Chamblee’s downtown. Ponce City Market: Enjoy “old-timey fun” like carnival amusements, mini golf and a giant slide (for the bigs) at Skyline Park, located on the roof of the PCM. Downstairs at PCM, check out great toy stores, like Rhen’s Nest and quaint book stores like Posman’s Books. 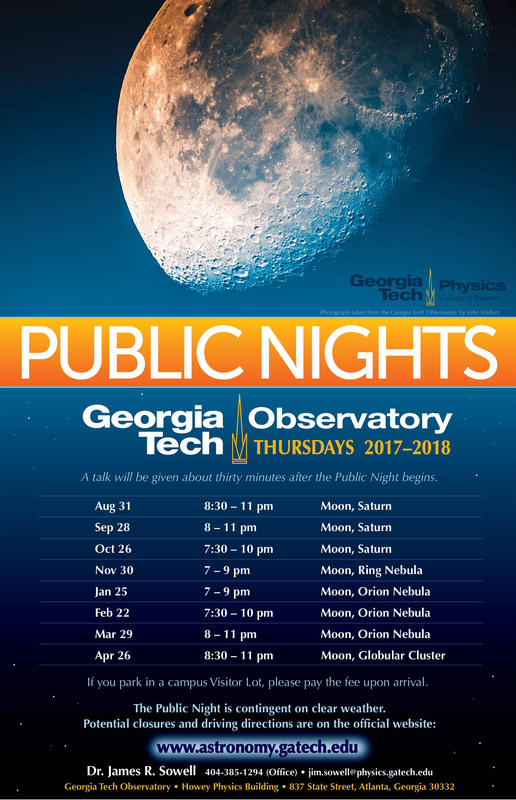 Georgia Tech Observatory: Take a turn gazing through the super-size telescope for an up-close view of the moon at Georgia Tech’s “Public Nights” one Thursday per month. Swell Mama Tip: Ask for a printed picture of the moon for a fun souvenir! Check out the calendar for the remaining 2018 dates. Atlanta Botanical Gardens: Check out the beautiful new children’s section! The new and improved playground includes a big slide, frog ponds, tree house climbing structure, honey bee hive viewing, and shaded splash pad. From special kids events to music and story times each week, they have really stepped up their game. Swell Mama Tip: Be prepared for the cost of parking! If you opt for a membership, put a mom or good friend as the other adult on the membership if a spouse is unlikely to join often. They can still come with you but this makes it easier to split the cost with a friend. Swell Mama Tip: Treat yourself and your little to lunch at the Atlanta Botanical Gardens’ beautiful new sit-down restaurant that was actually kid friendly. Check out the kids menu here. Center for Puppetry Arts: Opt for the annual membership and help this fantastic performance venue catered to kids of all ages. The Sesame Street museum is the coolest kid themed museum around and is included in your ticket purchase. Check regularly for new shows like Charlotte’s Web and Cinderella. A puppet craft upstairs is also included with the show purchase. The Center also boasts story time “Tale Time”, Toddler Tuesday “play shops” and museum tours. Atlanta Zoo – Get the membership, it’s well worth it. Go for the animals, stay for the splash pad, playground, and new tree top adventure! Swell Mama Tip: Easy walking distance to Dancing Goats Coffee, grab some delicious coffee (and locally made donuts) then relax while the kiddos play. Kennesaw Mountain: Take a hike with the jogger stroller (yes it is all uphill but paved) or choose to jump on the shuttle to the top. Just be prepared for pick up times. The museum and live ammunition demonstrations are a good start on history in our region. Swell Mama Tip: Bring a picnic blanket and pack a lunch. Picnics are best spent on the ample grass before the hike up. Swell Mama Tip: Wear yourselves out and then stay for a picnic dinner on the main lawn and the laser show, an Atlanta tradition. Marietta Picture Show: A budget friendly rainy-day option, take advantage of $1 movie tickets. Norcross Downtown Playground: An absolute favorite spot, especially after dinner downtown and during the free concert series in the open space next to the playground. Suntrust Park: Such a fun place on a pretty day. Meet up with friends for lunch or dinner even when the Brave's are not playing. Enjoy fountains, big screens, fun music, shops, great restaurants, plenty of outdoor space and splash park. Serenbe: Serenbe Playhouse puts on several kid-friendly shows each year, performed in the outdoors. There’s also a petting zoo, and you can request free feed for the animals. There is an inground trampoline plus plenty of outdoor areas to explore, including trails for horseback riding for older kids. Take a picnic lunch or dine at the casual Blue Eyed Daisy. Serenbe also features kid camps during June and July. Line Creek Nature Area: (Fayette County) A great place to take the kiddos to explore the outdoors. There is a pond suitable for fishing, a gazebo with picnic tables, and a short hike takes you down to the creek. Be careful, though - those rocks are slippery! Starr’s Mill Park: Starr's Mill is a tiny village a few miles south of Peachtree City off of Highway 74. The area is extremely picturesque and makes for a nice drive. In particular, be sure to check out the actual Starr's Mill building (from which the village grew around) located off Highway 85 on Starr's Mill Pond - it was a major filming location for the movie Sweet Home Alabama. Bring a picnic! Peachtree City, GA: Rent a golf cart in PTC - explore the golf cart paths of PTC, either on two wheels or four. There are several golf cart shops that will rent carts daily for a quick exploration. One of our favorite activities is to playground hop along the paths. Make sure to stop by the All Children’s Playground, located next to the library and city hall. Picnic tables are available for a picnic lunch. Swell Mamas Tip: Use google maps and select “bicycle” to find your way around on the paths. Just make sure to remember that there are only certain bridges and tunnels for crossing over the main highways of 54 and 74. If you happen to visit on a rainy day that makes outdoor playgrounds less than pleasant, head to the local toy store Shenanigans, which features an indoor play area for a small fee or free with purchase. Got a favorite place? Leave us a comment!! !